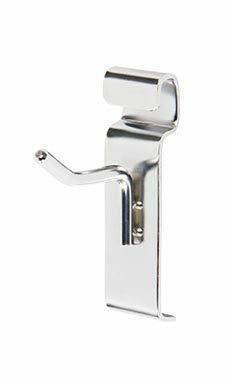 Give your displays a more sophisticated look by using these Chrome 2" Peg Hooks for Wire Grid! Allow these sleek hooks to raise your display standards by hanging your merchandise in an organized fashion that saves you space! Peg hooks are extremely easy to install and will transform your displays instantly. Maximize the efficiency of your gridwall today! Available in Chrome, White and Black. In stock and available for immediate shipment. Wonderful customer updates. Great customer service. Terrific product. These hooks are a great look for displaying of jewelry. Finally found short hooks! Nice price too. By Ellen Edwards from U.S.